I'm back! If you hadn't realised, I got married on April 28th in Cork and went on honeymoon to Greece and Germany for most of May. There was beer in both places so I'll write about those shortly but for now, here's some cider that was sent to me by Jack Daniel's. 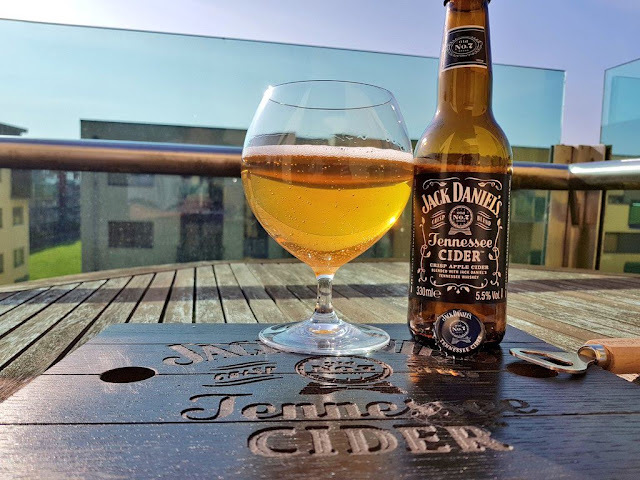 Yup, you read that correctly, cider from Jack Daniel's! They sent me a lovely black wooden box (apple crate) full of their branding. There were 4 bottles of cider at the bottom covered with a load of apples, each with a Jack Daniels sticker. That box now belongs to my cats. Sophie (black and white one) has made it her bed. It was a lovely sunny evening after work the other day so I brought a couple of bottles out to the balcony to try and here's what I thought. The aroma was all apple juice with a hint of bourbon and vanilla. I then tasted it and initially found it very sweet and juice like but then again, most ciders are very sweet to me. Full disclaimer, I'm not a major cider fan as I find them sickly sweet usually. There are exceptions of course but I prefer tart, dry ciders and if it borders on sour, all the better. Anyway there's lots of bourbon oak and vanilla going on here and it started to taste like a bourbon with cider in it. the bourbon starts to dominate. To me, it's very alcopop like but it's not completely unpleasant. In fact it grew on me slightly. This is one where ice might work better actually as it will cut some of that bourbon and sweetness which is perhaps what they are counting. Most people put ice in their cider. It's clearly not something I would personally buy myself but I'm not their target market as I wouldn't consider myself a cider drinker. If you like cider and have a penchant for whiskey, or even just a Jack and Coke, this could be worth looking out for. It's also only available in the UK and Ireland as far as I know. This is not to be confused with their Winter Jack, also labelled as Tennessee Cider. That's some sort of apple cider liqueur with Jack Daniel's whiskey. Also, I use the word bourbon above. Jack Daniel's isn't considered a bourbon but the process is almost the same and it tastes more bourbon than Irish whiskey or Scotch so that's the reason.